Founded in 1978 by Peter Arnold and Ron Frankel as the Great Keelboat Club, the GLKC (Geneva Lake Keelboat Club) was established as a keelboat-racing alternative to one design racing on Geneva Lake. When the GLKC was first established, scow sailors often derided keelboats as ocean going tubs without an ocean. Inland lake sailboat racing was historically done on scows. Scows were primarily used on inland lakes because they could, by their flat-bottomed, blunt bow design take advantage of the relatively smooth waters. In contrast keelboats were characteristically heavy and slow. Even though the heavy keel prevented keelboats from tipping over, it seemed pointless in the middle of summer when the sun was hot, the water was cool and everyone was looking for an opportunity to cool off in the pristine waters of Geneva Lake. Times have changed and so had sailor’s attitudes towards keelboat racing on inland lakes. In the mid 70’s Rob and Bob Johnstone designed and began promoting the J-24. This newly designed 24-foot keelboat was fast, sensitive, and fun to sail. Seasoned sailors flocked to the J-24 on the Great Lakes and on the East and West coasts. By the mid 80’s, the J-24 and its variants (Sonar, Merit-25, Martin 242) were appearing on inland waters. The GLKC was founded to promote sailboat racing of this new class of keelboat. 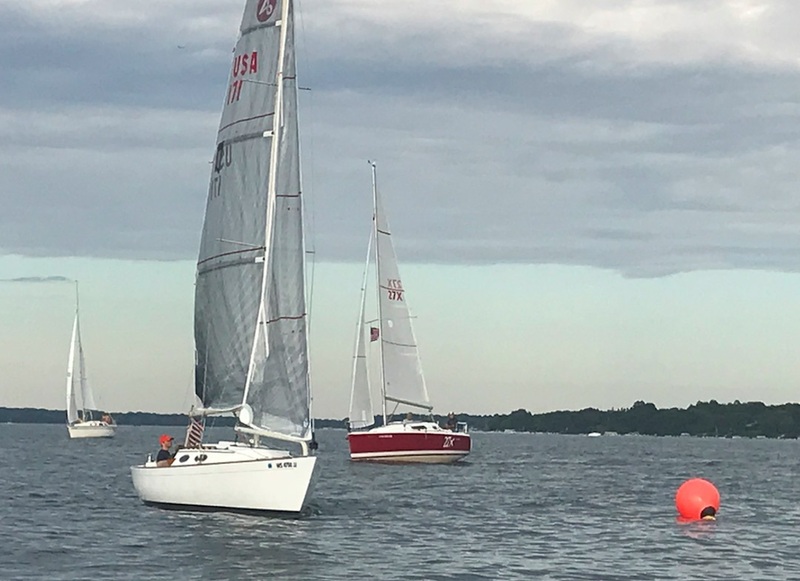 Because each keelboat was different, the club began a tradition of assigning a handicap rating (PHRF) to every boat in the club’s fleet to ensure that races would be exciting for everyone. The practice of handicapping boats also gave everyone a fair shot at walking home with a trophy at the end of the season. Today, 41 seasons after its establishment, the GLKC fleet is comprised of J-boats, Capri’s, Catalina’s, Alerion's, Sonars and many other keelboats. The different types of keelboats in the GLKC fleet reflect the diverse backgrounds and sailing experiences of its membership.